Asked what everybody wanted for our evening meeting snacks, half said cheesecake bombs, the other wanted chocolate fudge. 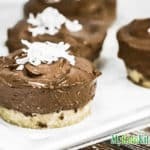 So I compromised, "Chocolate Coconut Cheesecake".. try this out we think you love it, everybody at My Keto Kitchen did. Preheat oven to 160C/320F and grease 8 holes of a standard sized muffin tin. Mix together the shredded coconut, almond meal and erythritol. Add the melted butter and mix well. Press the mixture into the bases of 8 holes of the muffin tin and bake for 10 minutes until golden brown. Allow the bases to cool. Place all the filling ingredients into a bowl and mix on low speed until combined. Mix on medium/high for 3 minutes. Spoon mix evenly over cooled bases and set in the fridge for 1 hour. Gently run a knife around the edge of each cheesecake, remove from the tin and enjoy.